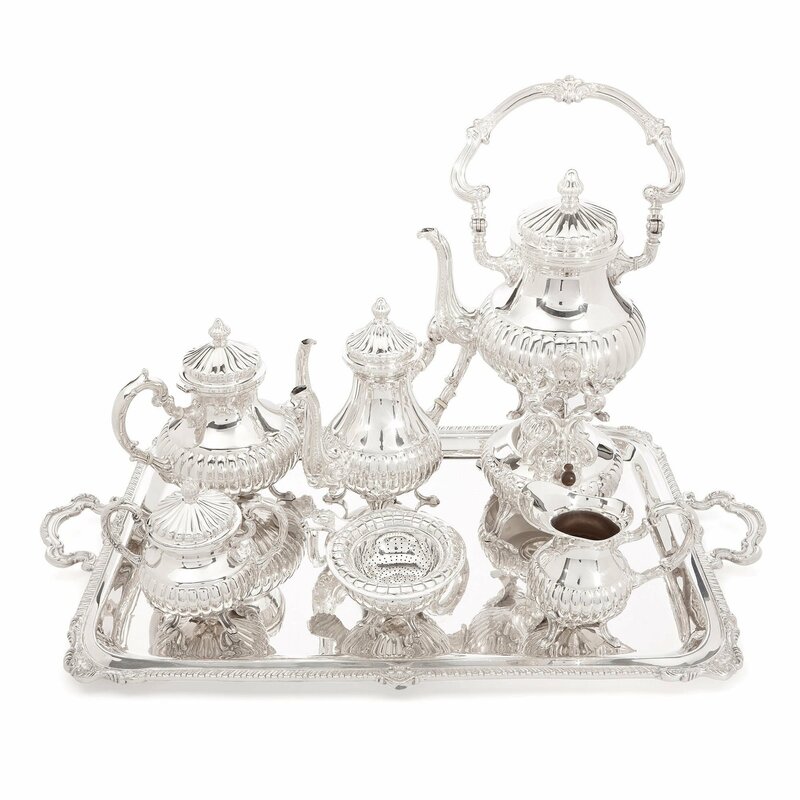 This elegant seven-piece sterling silver tea and coffee set will make a wonderful addition to a collection of silverware, or fine dinner service set. The silverware set consists of a large kettle, a tall coffee pot and slightly more squat tea pot, a twin-handled sugar bowl, a milk jug, and a tea strainer in a bowl. 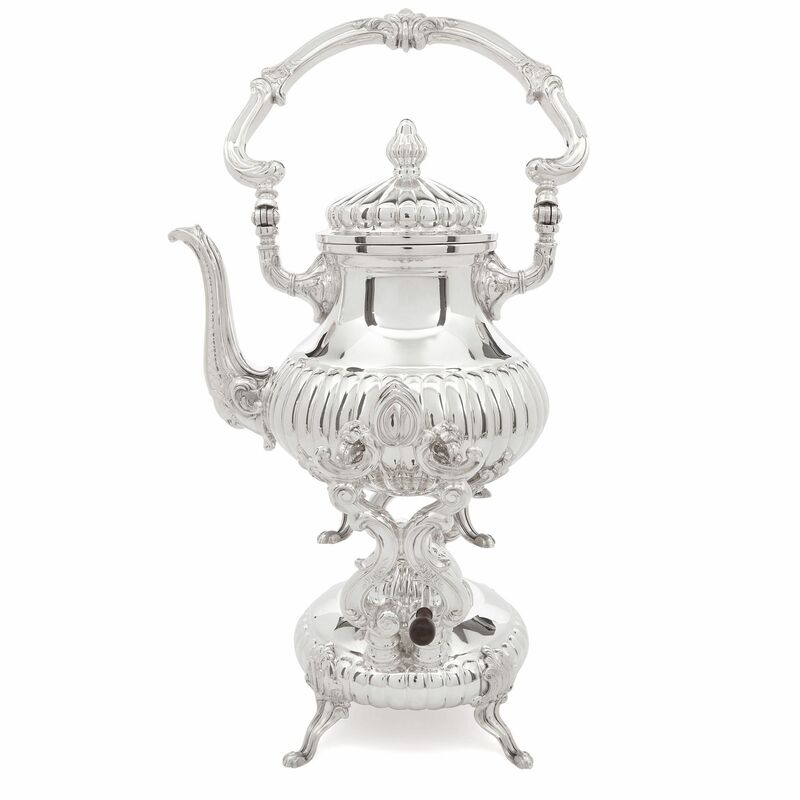 The kettle comes with a silver stand and burner, to heat water for tea and coffee. All of these items are arranged on a large tray, which is decorated with cartouches, and fitted with two handles. Each piece of holloware stands on four outward-curling feet, with foliate tops. The lower bodies of the vessels are fluted, while the tapered upper bodies are left smooth. 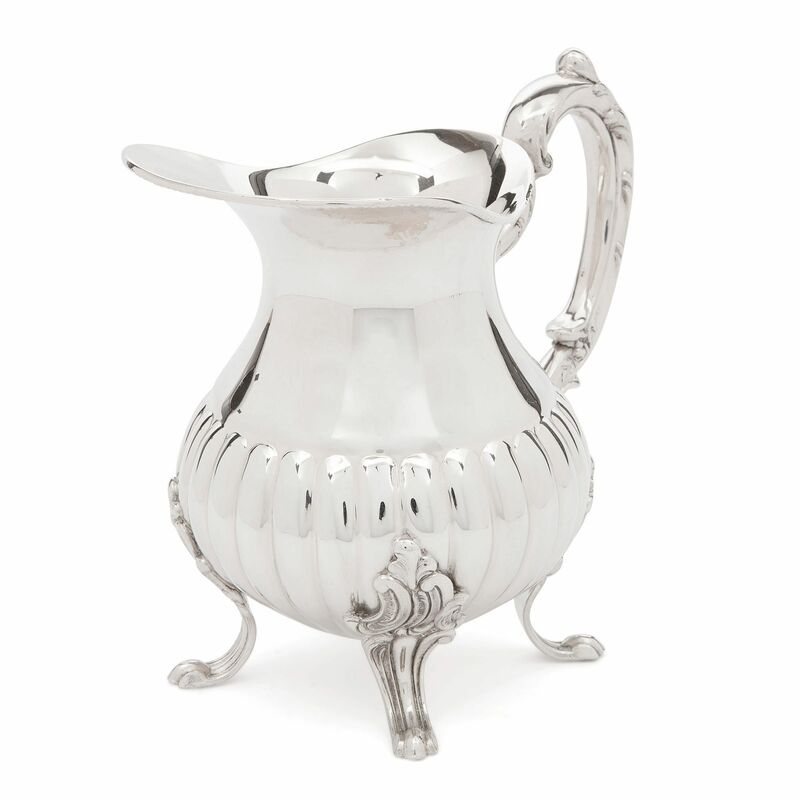 The tea and coffee pot and the kettle feature long spouts, which are lightly decorated with scrolling strapwork forms, and the milk jug has an open mouth with a projecting lip. The tea strainer is fluted and pierced with holes to allow the tea to drain through it. 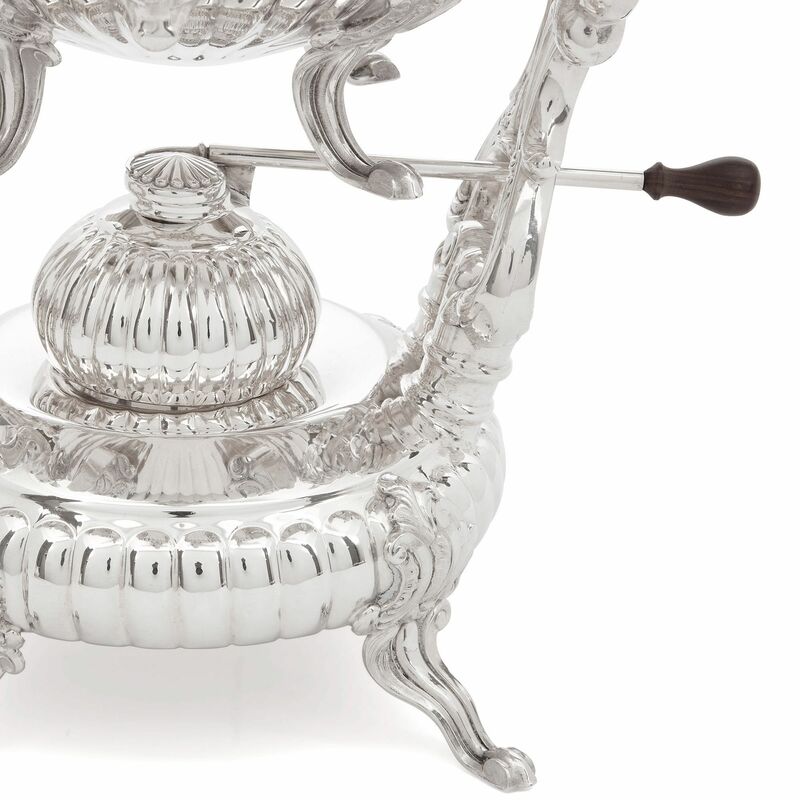 The kettle, pots, jug and sugar bowl are fitted with looping, strapwork handles — the sugar bowl with two, rather than one like the rest, and the kettle with a handle which forms an arch over the top of the piece. 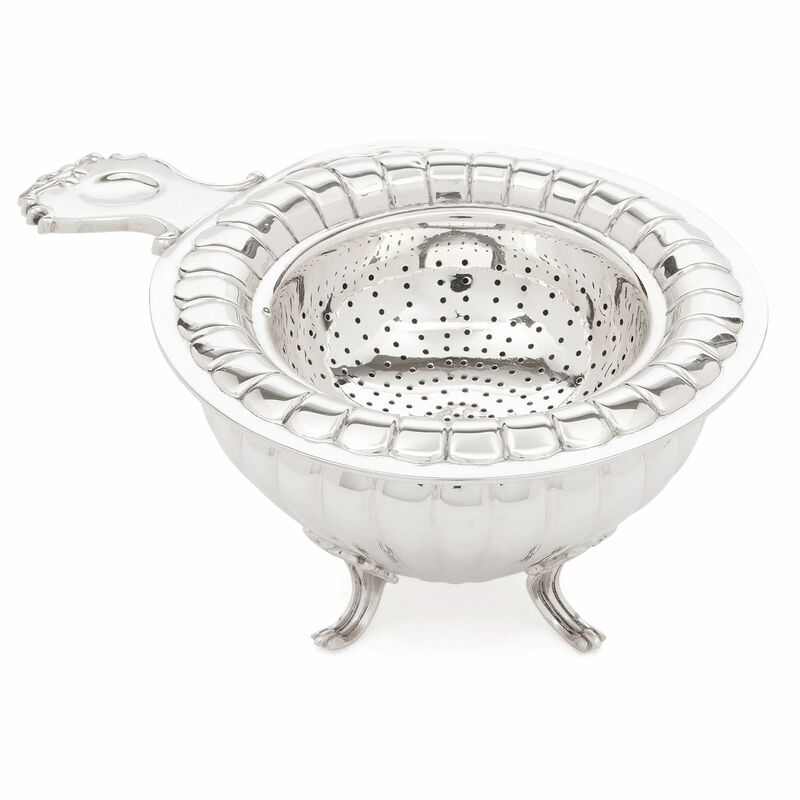 The strainer features a small, straight projecting handle. 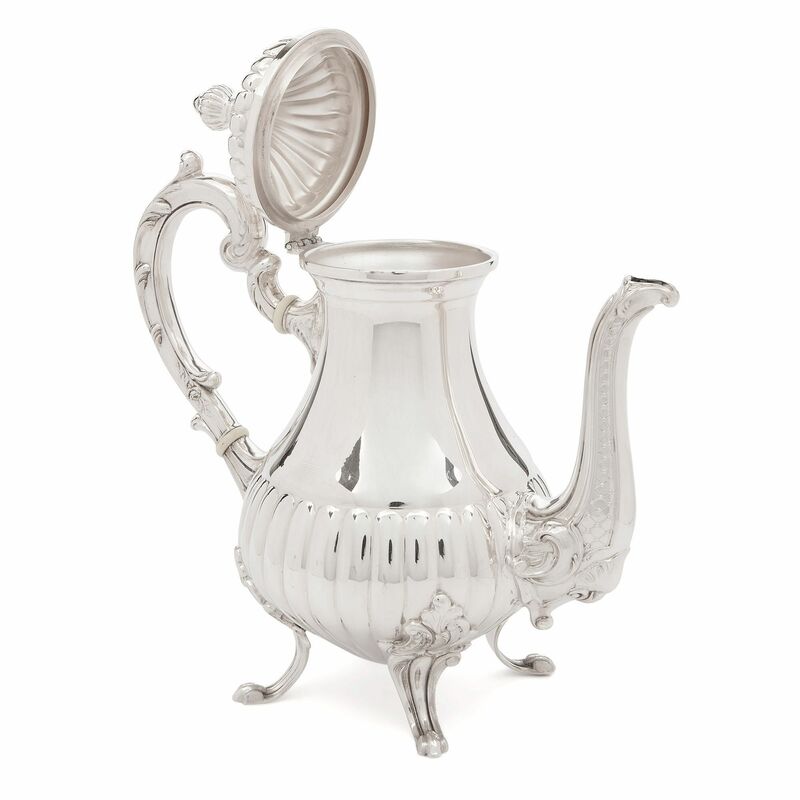 Pointed and fluted covers top the the sugar bowl, tea and coffee pot and kettle. 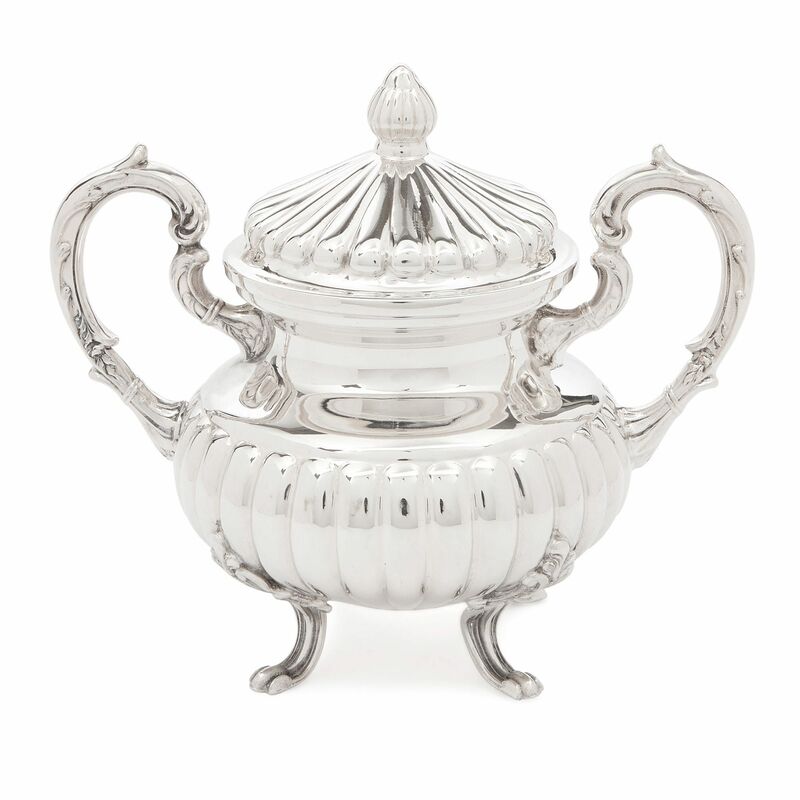 These are hinged in all but the sugar bowl, and are surmounted by pitched, soft-edged finials. The set is fully hallmarked and inscribed, ‘STERLING 975/CAMUSSO/MADE IN PERU’. 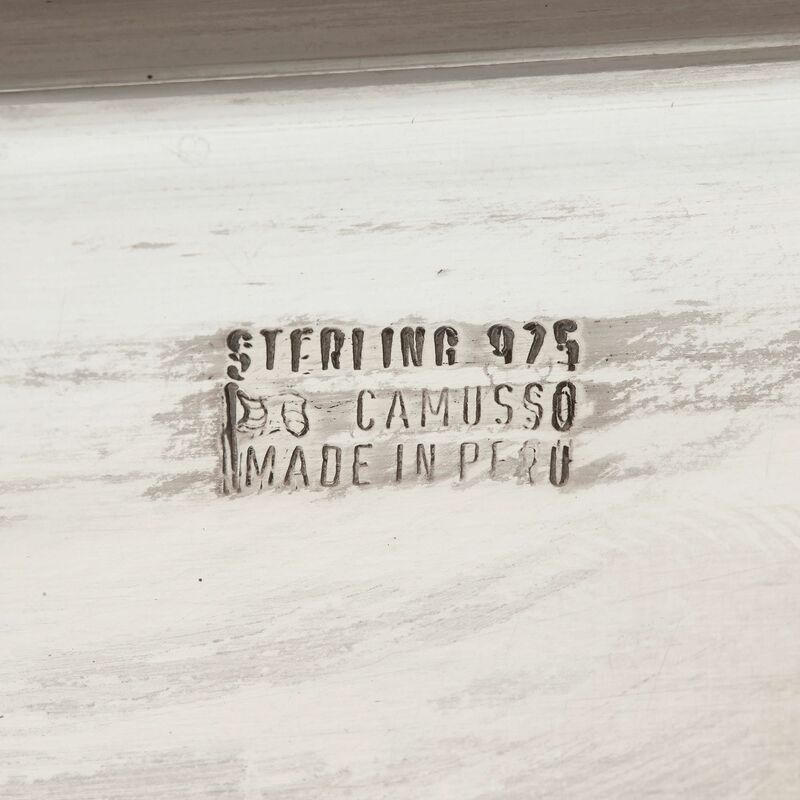 The manufacturer, Carlo Mario Camusso was founded in 1933 in Peru, in South America. 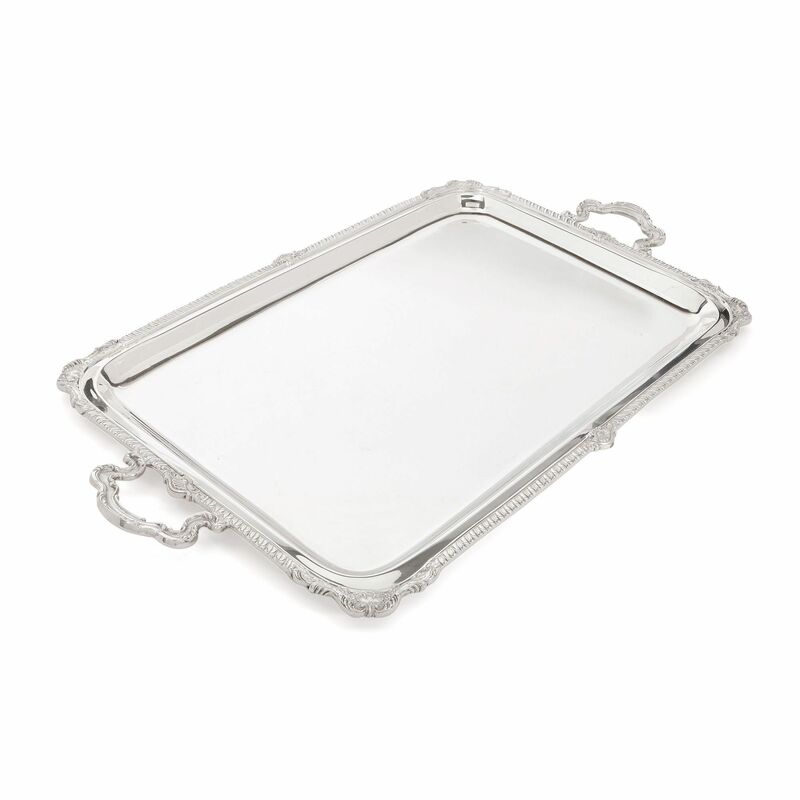 The company specialised (and continues to specialise) in high-quality silverware for an international clientele. Camusso have created items for royalty, embassies, government officials, and other notable figures.